First, I want to personally thank the citizens of Charleston for this incredible opportunity to serve. It’s a great honor to become Mayor of my hometown -- and at the same time humbling and exciting. Never before in our city's history has a mayor taken office at a moment so rich with the promise of a better, brighter future for all our citizens – we must only have the will, and the wisdom, to work together to claim that promise. Everywhere we look -- from West Ashley to James and Johns Islands, from Daniel Island to the Peninsula -- we see that promise ready to unfold. Already, our residents, neighborhoods, businesses, and others have begun to come together around a vision of our future where Charleston is a city of opportunity for all who live here -- and our citizens' quality of life comes first. But before we turn to our plan to make that hopeful future our own, let’s pause to recognize that our current good fortune is not some happy accident of time and place. We have not arrived at this moment by chance. This good fortune is here, and we are here, in no small part thanks to the leadership of one man -- a man who has led our city with courage and grace and dignity. 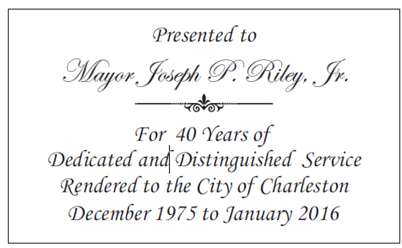 When Joseph Patrick Riley, Jr. came to the Mayor's office in 1975, Charleston was in many ways a city divided -- black from white, rich from poor, yesterday from tomorrow. But thanks to his leadership, our city began coming together. For forty years, he has led our city through triumph and tragedy. Along with our good citizens and many hard working Councilmembers, Mayor Riley rebuilt our economy, revitalized our cultural arts, preserved our history, and so much more. And through it all, no matter how trying the times or difficult the challenge, he has always made us proud -- proud of him, proud of ourselves, proud to be Charlestonians. Thank you, Joe. For forty years, you've been the best mayor in America -- maybe the best mayor in the world. You have left our city more prosperous, more united, more just. History will record that you were a giant -- and history will be right. So I guess that’s why folks have been talking about “those big shoes to fill.” And, you know, I’ve never asked the Mayor, “Just what size shoe do you wear?” Just yesterday afternoon, Mayor Riley was gracious to let Sandy and me go ahead and move a few things into the office, and he stated that he had already moved all his personal things out. But I did find these shoes of his in a back closet. So Mayor, I am going to respectfully ask that you take these big shoes of yours on home with you—I’ve got my own shoes. As remarkable as the last 40 years have been, a great city does not rest on its laurels. And as we gather here today to begin a new chapter in Charleston history, there is much work yet to be done -- work that we should, and must, do together. First, we must tackle the problems that have come with our success -- particularly in the areas of livability and quality of life. From traffic to tourism, from recreation to redevelopment, from public safety to public engagement and transparency, we face challenges that we can only solve by coming together around a responsible and robust plan of action. That is why I have already met with our Police Chief Greg Mullen, Fire Chief Karen Brack, and other public safety officials to ensure that we are doing all we can to keep our citizens safe and secure in our city -- that’s the #1 duty of your City government. It is why, today, immediately following this ceremony, I will convene a meeting of City officials to jump start the redevelopment and strategic revitalization of West Ashley. It is why, following that meeting, I will place calls to regional leaders to further our efforts to complete I-526. And it is why, in the days ahead, I will be working directly with our City Council and citizens to address flooding issues and sea level rise, to improve our public transit system and safety for pedestrians and cyclists, to achieve sustainable growth while respecting our environment, to improve the delivery of basic City services, to grow our knowledge-based and technology businesses and support small businesses, to help empower our brothers and sisters in need including our homeless, to build upon our rich cultural heritage and the arts and music, to add parks and beautify the public realm, and so much more. No matter what neighborhood, issue or opportunity, we will always be striving to improve the quality of life of our citizens. The second challenge that we must, and will, address together over the next four years is that of ensuring real, meaningful opportunity for all of our citizens, regardless of region or race or creed or circumstance. And to that end, we must, and will, work across communities and jurisdictions to end disparities in education (the great equalizer), provide affordable housing, seek social and economic justice, and more. Yes, we must address the disparities that have kept too many of our residents from reaching their full potential, and from enjoying the quality of life we want for all our citizens. So here, in this unfolding story of Charleston’s history, with that promise of a hopeful future, let us challenge ourselves this day, to accept any test or trial, and respond with excellence and enlightenment. To be open and inclusive. To show that good citizens, working together collaboratively, can tackle any challenge. To show that with faith in God, and love in our hearts, we will be an example to the world -- not just in the wake of tragedy as Charleston has already done, but in our actions going forward. An example to the world of how folks work together, get along, provide opportunity for all, and find peace in this world. That’s how we truly earn the name of the Holy City. That’s the sacred honor our country’s founders idealized, and upon which we build and continue to strive. And so now, with unity of purpose and clear goals in mind, the work begins. We know that it cannot and will not be completed in four days or four months or even four years. But we also know this: With good will, hard work, and a commitment to excellence in all we do, Charleston's best days are still ahead. I again thank you. I thank God, to whom I give glory. God bless you, and God bless this great City of Charleston.